This entry was posted on May 2, 2016 at 9:36 pm and is filed under Crime, Horror, Thriller with tags 2016. You can follow any responses to this entry through the RSS 2.0 feed. You can leave a response, or trackback from your own site. It’s a pretty rough and grimy movie, but I loved just about every second of it. Nice review. It started out great but it lost me at the end. So much potential. 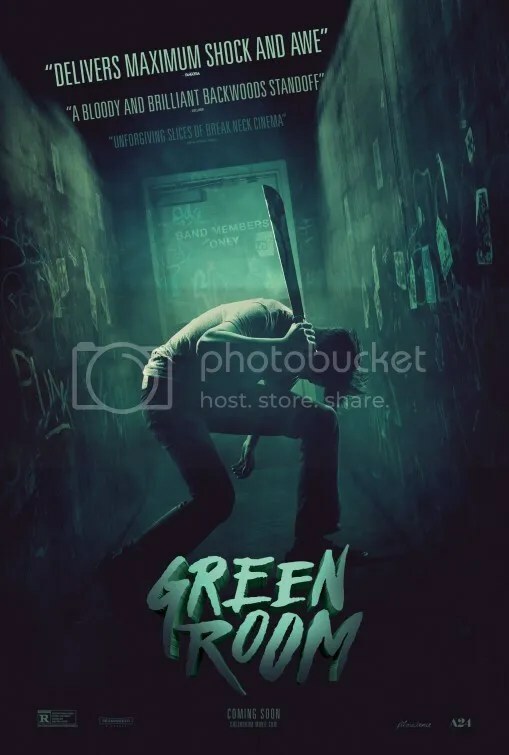 I loved Green Room. Might be my favorite film of the year. I disagree that the character development diminishes the ability of someone to care. I was on the edge of my seat the entire time, captivated by the against-the-odds furious fight for survival happening on screen. I was still rooting for the young punks to make it out despite not knowing much about them. I also didn’t feel like the story lost any steam or intensity as it all built to its intense showdown. For me it was a tight 90 minutes that left me reeling for hours and days from the trauma of the events that unfold in it. There was a depressing nihilism that kept me from embracing this movie. I wanted the punks to rise above their lot but they were just….punks. I needed them to have more humanity. Naturally I should care that people escape from being murdered. Yet I really didn’t in this story. That bothered me. There were some humorous moments that helped though. Their ongoing “desert island band” discussion was a highlight. Yes, I loved how the film ended. Really cracked me up.